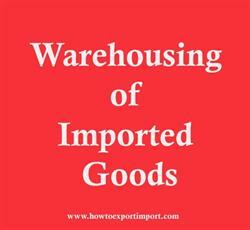 The facility of warehousing of imported goods in Customs Bonded Warehouses, without payment of Customs duty, is permitted under the Customs Act, 1962. In addition to that, the provision of the Warehoused Goods (Removal) Regulations, 1963 and Manufacture and Other Operations in Warehoused Regulations, 1966 are also applicable. Basically, goods after landing are permitted to be removed to a warehouse without payment of duty and duty is collected at the time of clearance from the warehouse. The law lays down the time period upto which the goods may remain in a warehouse, without incurring any interest liability and with interest liability. The warehouses are to be appointed/licensed at particular places only which have been so declared by Central Board of Excise and Customs. The Board has delegated its power for declaring places to be Warehousing Stations to the Chief Commissioners of Customs. In respect of 100% EOUs, the powers to declare places to be Warehousing Stations have been delegated to the Commissioners of Customs. Any goods deposited in a warehouse may be stored upto a period of one year in the Bonded Warehouse. In the case of capital goods intended for use in any 100% EOU, such goods can, however, be stored up to a period of 5 years. The warehousing period can be extended by the Commissioner of Customs for a of 6 months and by the Chief Commissioner of Customs for such further period as is deemed fit by him. The importers should file their applications for extension well before the expiry of the initial/extended period of warehousing. (a) Goods supplied as ship stores/aircraft stores. (b) Goods supplied to diplomats. (c) Goods used in the units operating under manufacture-in-bond scheme. (d) Goods imported by 100% EOUs. (e) Goods warehoused and sold through duty free shops. (f) Machinery, equipment and raw material imported for building and fitment to ships. Extensions in warehousing period are not meant to be granted routinely but only in such cases where the goods have to be kept in the warehouse under circumstances beyond the control of the importer. Lack of finance to pay the duty is not considered as valid and good ground of seeking extensions which are otherwise given for short period. In case the warehoused goods are likely to deteriorate, the Commissioner of Customs may reduce the one year's period of warehousing to such shorter period as he may deem fit. (d) Where any bonded goods have not been cleared for home consumption or exportation or are not duly accounted for to the satisfaction of the Customs. In case the owner fails to pay the amount as demanded above, Customs may detain and sell, after notice to the owner, such sufficient portion of the bonded goods as may be selected. Mohan Goswami: On 31 August 2017 How to generate the way bill from computer. Material purchased from Chandigarh to Kolkata.What is the procedure?